Audi has published the first official photos and details of the new A1, due to launch in the UK this November. Redesigned from the tarmac up, the second-generation A1 is much bigger than the original car, stretching for 4.03 metres – 56mm more than before. 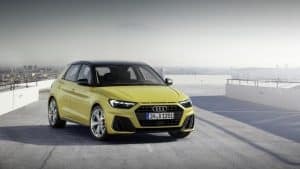 That’s just as well, because the littlest Audi will only be available as a five-door Sportback, with three-door variants no longer being an option. Width and height are pretty much the same as before – at 1.74 metres and 1.41 metres respectively – and the supermini still has that low-slung stance with a wide track and short overhangs. That extra length means the A1 can offer more boot space than before, with luggage capacity growing by 65 litres to 335 litres – 1,090 litres when the rear seats are folded down. Under the bonnet is one of three TFSI petrol engines: a 143bhp one-litre three-cylinder unit (named 30), a 148bhp 1.5-litre four-pot engine (35), and a 197bhp two-litre option. A smaller TFSI engine with 94bhp will be added the range as the A1’s entry-point engine shortly after the car launches. Each engine can be linked to either a manual gearbox or the seven-speed S tronic dual-clutch gearbox, with the exception of the 197bhp two-litre petrol, which comes linked to a six-speed S tronic transmission as standard. Spec-wise, equipment will be split over three trim levels: SE, Sport and S line. Full spec lists haven’t been published yet, but Audi says even the entry-level SE version will be well-equipped, featuring a fully digital instrument cluster with a high-resolution, 10.25-inch display and a multifunction steering wheel as standard. Range-topping S line models add styling flourishes such as larger air inlets, striking twin tailpipes, additional sill trims, an elongated slit centrally below the bonnet with two fins and a larger rear wing. You can order the new A1 from September and expect to have the keys around November.